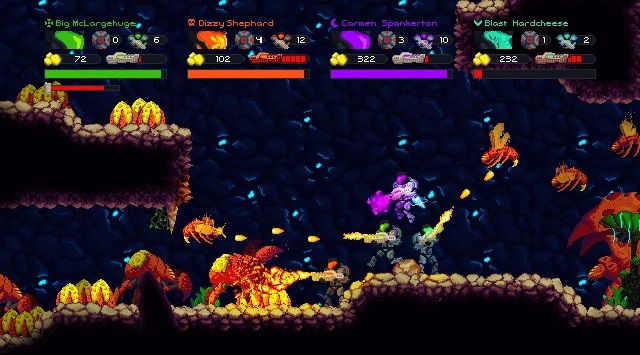 Hive Jump, the over the top multiplayer platformer from Graphite Lab, has had an up and down relationship with Kickstarter. The first campaign was an unfortunate dud for a variety of reasons. However, a few weeks ago the developers headed back to Kickstarter for another round and things have been going much smoother. Graphite Lab head honcho Matt Raithel was kind enough to take some time to talk to us not just about Hive Jump, but his teams Kickstarter experience, Gabe Newell, drugs, and Orlando Bloom. Cliqist : Tell me about yourself. Who are you? Who would play you in a movie? I’ve been told I look like a lot of very different people… from Orlando Bloom to some guy on the TV show Homeland… but I suppose if they made a movie about my life they would cast like Tobey Maguire or someone like that…the friendly neighborhood Spiderman type. 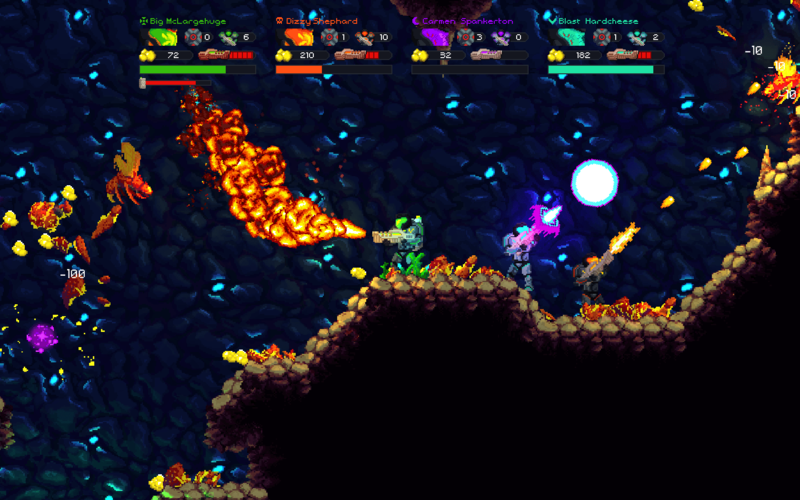 Cliqist : Hive Jump is just another pixel platformer, isn’t it? Matt Raithel : Heresy! Blasphemy! Ok, so we are totally a pixel platformer, but we feel there are some differences that help us stand out. First, let’s talk about the pixel part. We’re building the game in Unity, with some great shaders supplied by Sprite Lamp which allow us to normal map all of our sprites to get some really incredible 3D lighting effects. 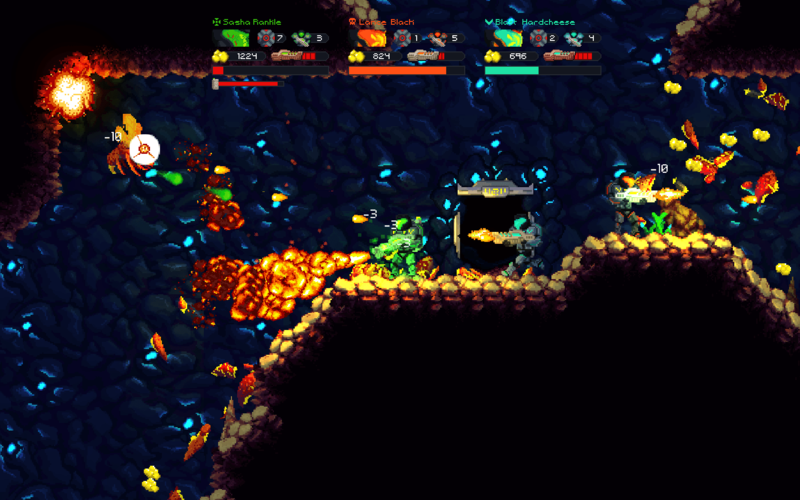 When you fire your weapon in Hive Jump, you’ll see the bullets light the back side of the cave as it zips toward its prey. Upgrade that rifle to a flame thrower and you’ll see gorgeous red and orange light illuminate your foes as you burn them crispy. The aliens you’ll fight are partially luminescent too, so when they creep through the deep their eyes will glow in the darkness. Not your average pixel! About the platformer part: Hive Jump definitely has some solid platform jumping moments, but the difference is that we’re insanely action packed and you have a sweet jetpack to propel you from craggy cliff to craggy cliff. The alien swarms are constantly attacking and that means players have to be constantly moving or they will be lunch. Beyond that, we’ve got local and online co-op included which means players are going to be linking up with other players to tackle the hives. Lastly, our platforming levels are all intertwined within a bigger picture: an XCOM-like strategy mode where you determine what parts of the Hive you should strike next. Players can fortify locations they control and chose to attack different locations the enemy controls. These choices impact how difficult the platforming sequences are (such as how deep the hives go, how many aliens will spawn and so forth). So when we look at Hive Jump, we see much more than another pixel platformer. Hopefully gamers feel the same way! Cliqist : If Hive Jump was an illicit drug, which would it be; and why? Matt Raithel : Gonna go with LSD. Though I’ve not had the pleasure, I’m told you see pretty colors after taking it, and Hive Jump is totally filled with pretty colors… and scary monsters which I’m told can also appear when taking LSD. Cliqist : What was the mood and tone with the team when you realized the first Hive Jump campaign wasn’t going to make it? What were the signs? Matt Raithel : Strangely encouraged. About a week in, we talked to a lot of friends about what our big mistakes were with that first campaign. Aside from a slow funding start, the biggest criticism day 1 was that the game “came out of nowhere” and not in a good way. There was literally NO press about the game when we launched because we used the Kickstarter campaign to announce the thing – rookie mistake. If the feedback was something like “your game is bad and you should feel bad”, then we would have felt bad. But, since the feedback was totally something we could correct for, we cancelled the first attempt, did a group hug, and set a course to do better with a second campaign. Cliqist : Congratulations on the success of the latest campaign so far; it’s outperforming the original by a significant margin. What have you done differently? We started talking about the bloody game. We took an early demo to GDC, we continued shipping updates on the old Kickstarter page, we kept our Greenlight process going (getting greenlit in the process) and we continued to share development progress with press and gamers alike. We refocused our funding goal. Lower isn’t always better, but a lower goal certainly puts the project in a more positive light in terms of percentages. We secured some additional private funding to keep the project rolling during the refactoring process and we rebooted with a lower funding goal. We improved the visual style. We’re still in love with super low res pixel art (like the first versions of the game used) – but we worked around the clock to up-res the visuals to be more detailed and more suitable to show off what we were capable of artistically. We completed more of the game before launching on Kickstarter. We realized that we needed to develop much more of the game in order to show more unique features on day 1. We now have a more complete game design and a more solid development foundation on which to complete the game. We crafted a plan for consoles. We knew this game would be great with local “couch” multiplayer, so we added that in making the consoles much easier to leap to. We added Wii U to the core package based on development support they provide to Indies who make games using Unity. Cliqist : No one has pledged at the top thee tiers ($1,000, $2,500, and $5,000) yet. If you were in an elevator with a millionaire what would you say to them to convince them to back at one of those tiers? Matt Raithel : Can I pitch to a billionaire instead?! “Hi Mr. Newell, fancy meeting you on this elevator! Wanted to say thanks for making Halflife. We all enjoyed it a lot. Steam is also great and gives us indies a way to get our games out and into the world without getting bent on the manufacturing costs. Thanks for that too! Say, we’ve got this game called Hive Jump which is now LIVE on Kickstarter. We’re doing something cool at the $2,500 backer tier: You and our designers will tag team the design of the most fearsome alien boss ever made and best of all, we’re going to take the actual CODE that drives that boss and print it on a high quality poster (all artsy like). Then, we’ll add pictures of the boss that you designed to the poster. Being a programmer yourself, we think you would be perfect for tier! Better yet, since you are so well known and awesome, we’ll offer your poster as an ADD-ON after the campaign is done. So other people can buy it too: but we’ll donate ½ of the proceeds of those sales to CHILD’S PLAY the charity started by PENNY ARCADE that helps hospitalized children by sharing the magic of gaming with them. Cliqist : Hive Jump seems pretty multiplayer focused, but I don’t have any friends; can I still enjoy it? Matt Raithel : Sure you can! We’ve got online multiplayer in the plans so we’ll find friends for you via the magic of Steamworks player matchmaking! Although, if you want to play true single player, you most certainly can do that too. All the features of the game are enjoyable in single player mode. Cliqist : When can we get our hands on something playable? Matt Raithel : We’re going to be showing the game off at the Penny Arcade Expo next week! Stop by our booth, meet members of the team, play the game, get cool swag! Although if you are not going to PAX and want to see the build, you could send a nice email to info@hivejump.com and ask us to send you a copy. We’ve got a press build that we’re sharing, and hope to have a full public demo shortly. Cliqist : Is Hive Jump a scam or unattainable pipe dream? What assurance do backers have that they’re not throwing their money away? Matt Raithel : As a team, we have over 25 years of combined game development experience with credits in over 60 shipped titles. We know how to ship games, and we’ve already poured 7 months into the development of Hive Jump (along with pouring our hearts, souls, blood, sweat, tears, and other body fluids into the game). So, while there are no guarantees in life, Hive Jump means the world to us, and we’re doing everything we can to make this game awesome. Cliqist : Can you close us out with a Hive Jump inspired haiku? To learn more about Hive Jump head on over to its Kickstarter campaign before it closes on September 5th. Greg Micek has been writing on and off about games since the late nineties, always with a focus on indie games. He started DIYGames.com in 2000, which was one of the earliest gaming sites to focus exclusively on indie games.